Brass urns with an electroplated finish of slate, pewter and/or copper. 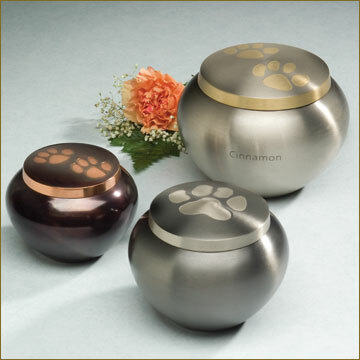 Tiny pawprints adorn the tops in either pewter, bronze or copper finish. Due to the shape of the urns, only one line of engraving (optional) is allowed. Engraving of your choice may be ordered here.